The Young Americans have taken over Everett. 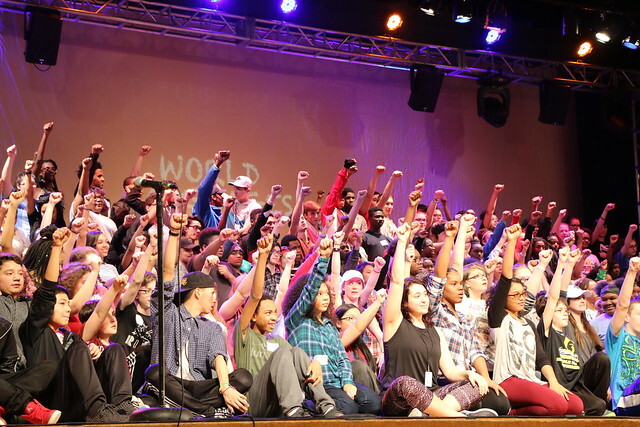 A professional music group, The Young Americans recruited over 200 Lansing students to perform in two big, exciting performances this weekend. 49 trained members of the Young American arrived Wednesday night. Students were in workshops after school Thursday and all day Friday. After a Saturday morning rehearsal, they will be putting on two shows for the public, at 3:30 and 7:00. The process of bringing The Young Americans to Everett has been going all year. Things really ramped up after winter break. “[In January], they sent four ambassadors, [who] performed and talked about the Young Americans program just to get kids kinda excited and interested in doing the performance in the workshop,” said drama teacher Cathleen Weaver. The Young Americans have not been here before, so it will be the first time students from Everett will be working with them. Each year, Young Americans visits over 200 communities and work with over 52,000 students from kindergarten to high school. According to the Young Americans website, their purpose is to provide members of The Young Americans with a learning environment that allows them to experience innovative and creative learning with academic diligence that advances artistry and leadership skills to establish each student as a lifelong learner. Many students are excited for their shot at the spotlight. “Everyone in the classroom was really excited! The Young Americans gave a really good vibe and I signed up as soon as I got home,” said sophomore Tien Nguyen. Many see the visit as a positive thing for Everett’s students, and for the school’s performing arts programs. “It’s a good chance to get exposed to new opportunity in the performing arts area and we are raising money for Everett’s art classes,” said freshman Savannah Sykes. Admission is $5 for adults, and $3 for students and children. Present at the 7:00 show will be representatives from the Demmer corporation, who sponsored the event, as well as school board members. In addition, a donation supporting the Everett band program will be made during the 7:00 show. “I think it’s cool and I think it’s something that the kids can enjoy! It was very upbeat, uplifting and it was just fun to hear,” said junior Celeste Montalvo. To view photos from today’s rehearsals, scroll through the slides above, or click HERE.